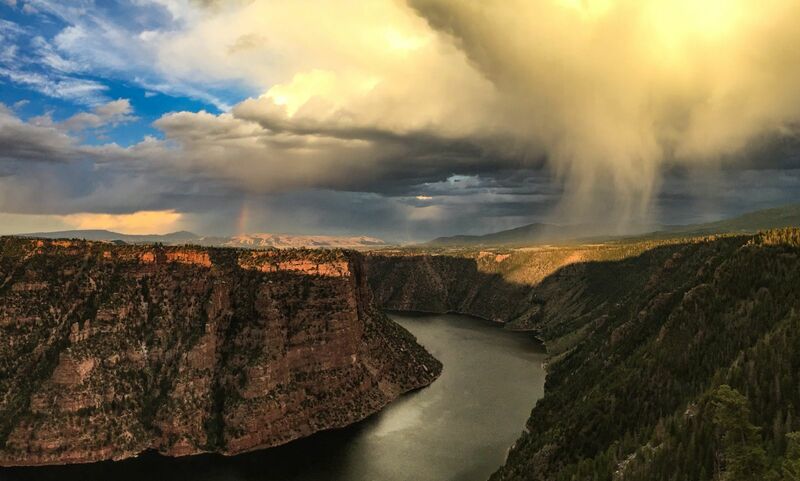 Flaming Gorge National Recreation Area, nestled in the northeast corner of Utah, is aptly named. When the late-afternoon sun hits the crimson cliffs, they illuminate with other-worldly color that has to be seen to be believed — photos simply don’t do it justice. 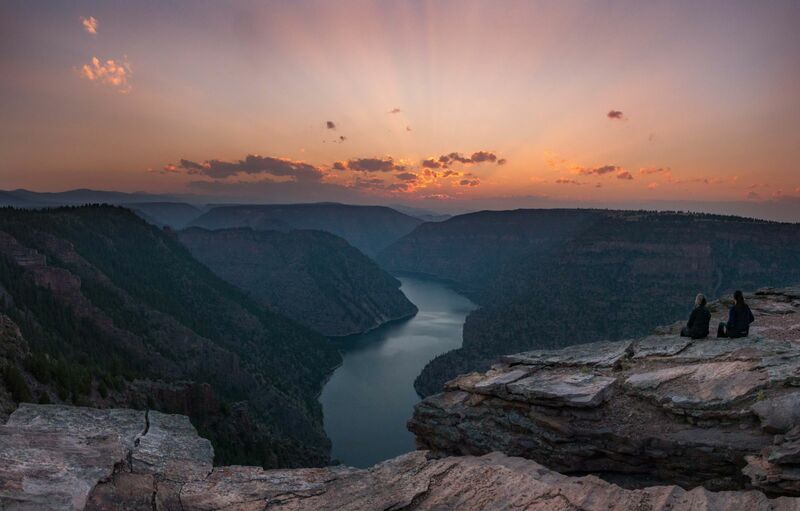 When Major John Wesley Powell and a team of explorers first set eyes upon the walls of the 1,400-foot canyon in 1869, they were so brilliant that they thought they were on fire, and the name “Flaming Gorge” was born. The brilliant blue reservoir that dominates the landscape is 91 miles long with 360 miles of shoreline, perfect for endless water skiing, kayaking and stand-up paddleboarding. And the fishing is world class. It's a Blue Ribbon area with regular 40-pound lake trouts being hooked every year. Kokanee salmon and smallmouth bass are equally epic. Below the lake on the Green River (also aptly named, reflecting the large amount of limestone in the water), experience rafting and fly-fishing for rainbow and brown trout. With all of this available to explore, a good place to get a lay of the land and make a plan is, as always, the visitor center. First off, the lookout that sits cantilevered out above the gorge boasts some of the best views of the whole canyon. Yet it's just an appetizer of the things to come. If you spend a few minutes talking to the enthusiastic rangers, you can get a quick education on the flora and fauna of the area, the ancient people that lived there, and the local geography. Armed with your newfound knowledge, head out for a hike on the Canyon Rim Trail, conveniently starting right outside of the building. 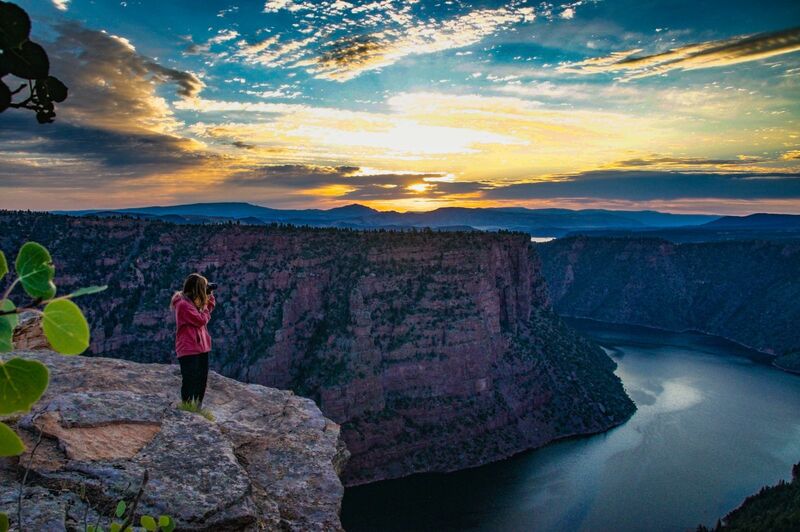 The easily accessible Canyon Rim Trail lets visitors take in stunning views without much effort. This casual, family-friendly trail is 4.5 miles one-way and links the Red Canyon Visitor Center to the Greendale Overlook on Highway 44. It’s open to both hikers and mountain bikers. The hike itself is mellow despite being at an altitude of 7,400 feet — it only gains a total of 227 feet in elevation. But, what it lacks in physical difficulty, it makes up for with breathtaking views. In fact, it sort of feels wrong to score these postcard-worthy views without even breaking a sweat — it feels like cheating. 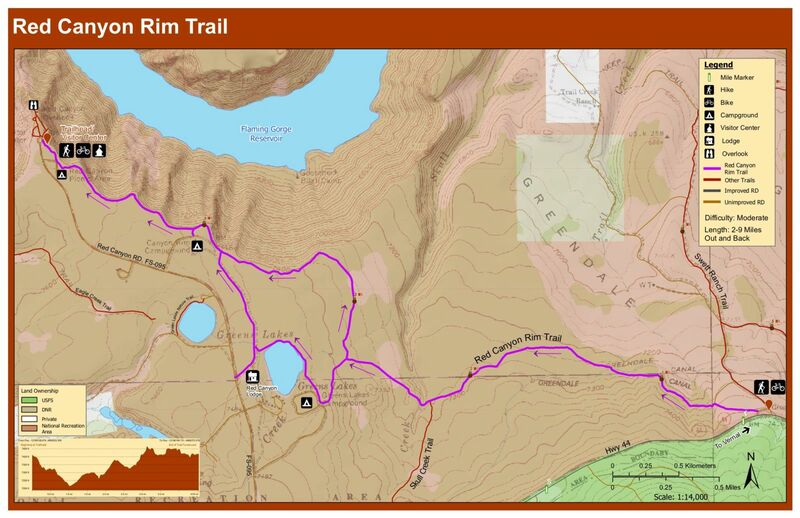 The start of the hike follows the south rim high above Flaming Gorge Reservoir. The trail’s informational signs talk about the wildlife and the ecosystem, and various viewpoints somehow manage to rival the vistas back at the visitor center. Keep an eye out for bighorn sheep barely clinging to the precipices in the canyon. Just past the first mile, the trail turns away from the rim and weaves through meadows of colorful wildflowers and tall, native grasses, and under the shadows of towering, fragrant ponderosa pines. 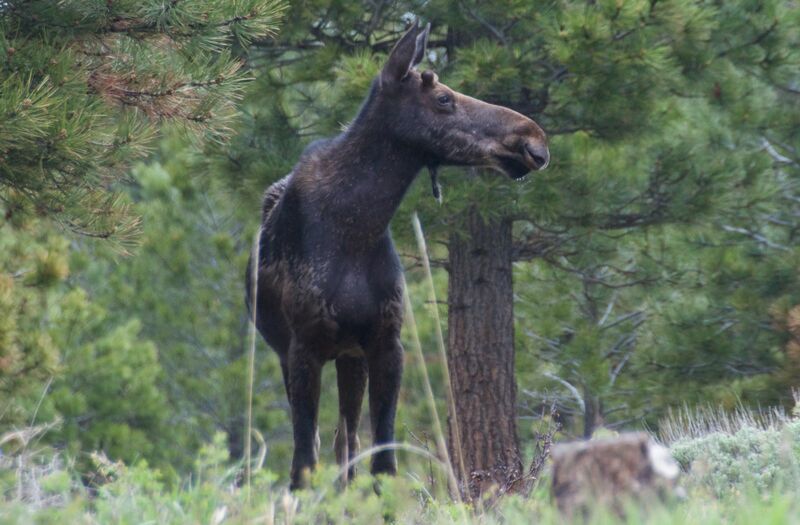 Deer, moose and elk are frequently spotted along this section, so keep a camera ready. At about 2.5 miles in, there is a small footbridge over Skull Creek (fortunately, not aptly named). This is a perfect place to turn around if you’re looking for a short hike or time is limited. After you travel 4.5 miles, the trail ends at a lovely picnic area at State Road 44. It’s a good place to stop, have lunch and watch for falcons, red-tailed hawks, American kestrels, ospreys and even bald eagles. Most people do this hike as an out-and-back, but it could be done as a shuttle if you first park a car at the State Road 44 endpoint and then drive to the visitor's center to start the hike. If you don’t arrange a shuttle, just head back on the trail the same way you came and catch all the things you missed on the way out. From Vernal: Take U.S. Highway 191 north for 35 miles. Turn left onto State Road 44 for 3.5 miles. Turn right onto Red Canyon Road for 3 miles, and follow signs to the Red Canyon Visitor Center. Dogs Allowed: Yes, on leash in campgrounds, picnic areas, and trailheads at all times. Restrooms: Yes, at the visitor's center and campgrounds. Written by Shaine Smith for RootsRated Media in partnership with Utah Office of Tourism. Thank you for visiting http://www.flaminggorgecountry.com/scenic-canyon-rim! Be sure and revisit flaminggorgecountry.com frequently for content updates and more.